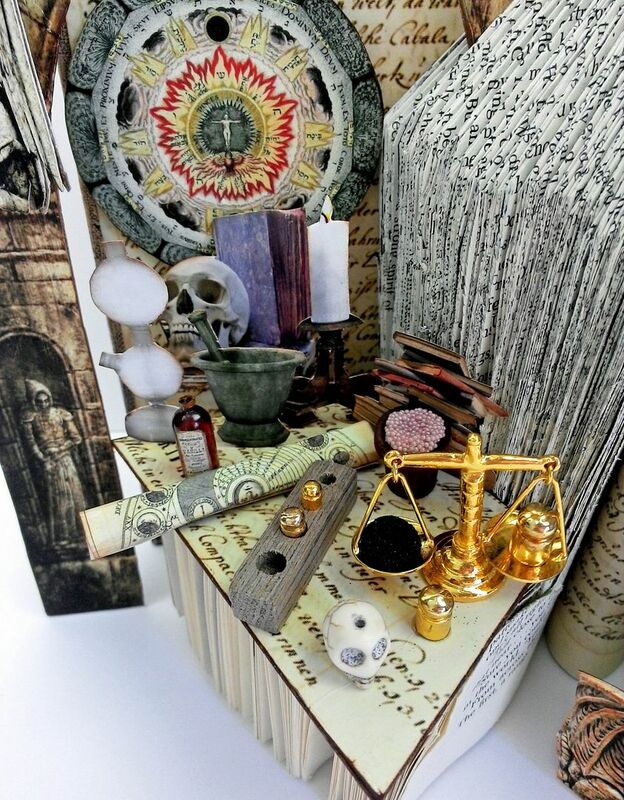 I thought I would start easing into the Halloween season with two Alchemy themed projects. 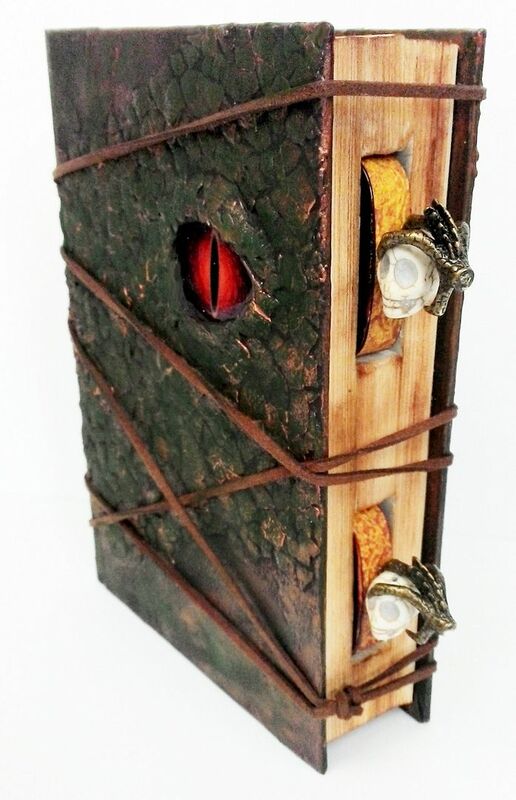 Both feature altering books where I've used egg shells to create a texture on the cover of the books. 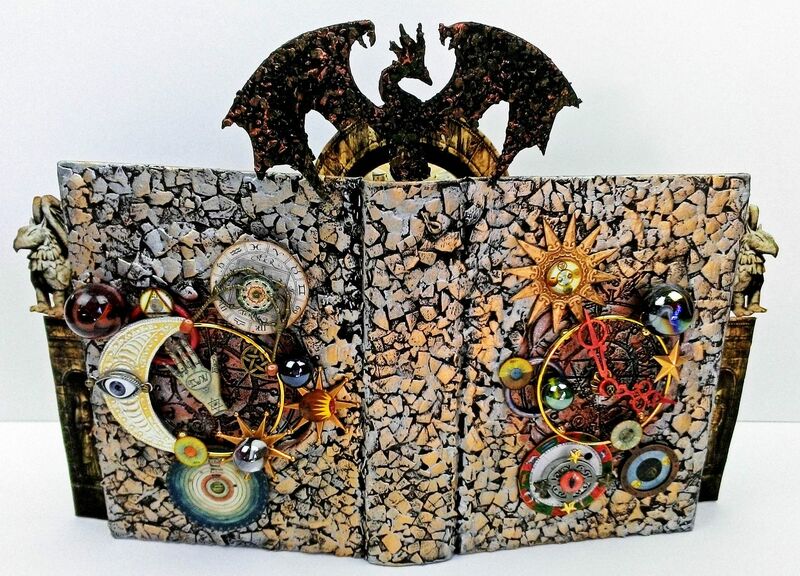 The first altered book features a dragon’s eye surrounded by its scales. 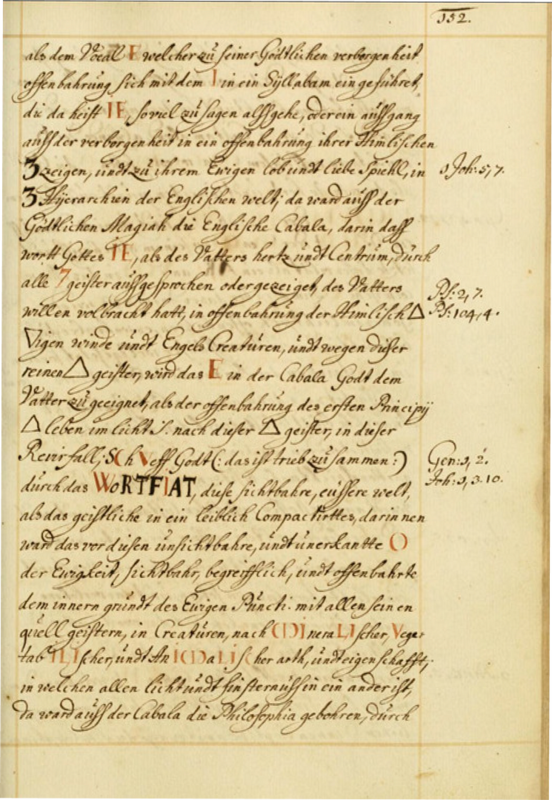 Two holes cut into the pages on the side of the book, accommodate small tins filled with tiny bottles containing substances the alchemist would use in their quest to transmute elements into gold. 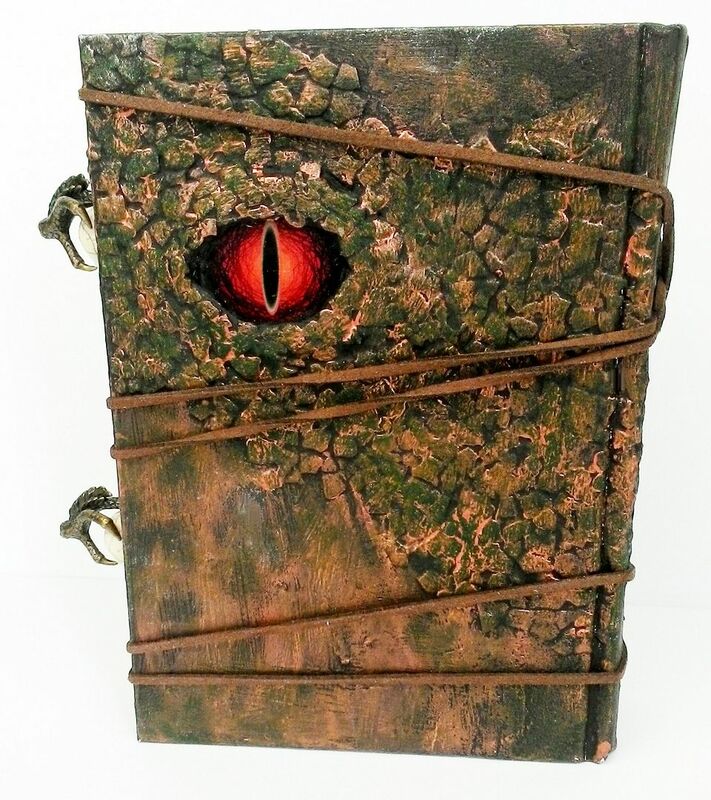 Faux suede cord wrapped around the book keeps the dragon contained and the tins in place. 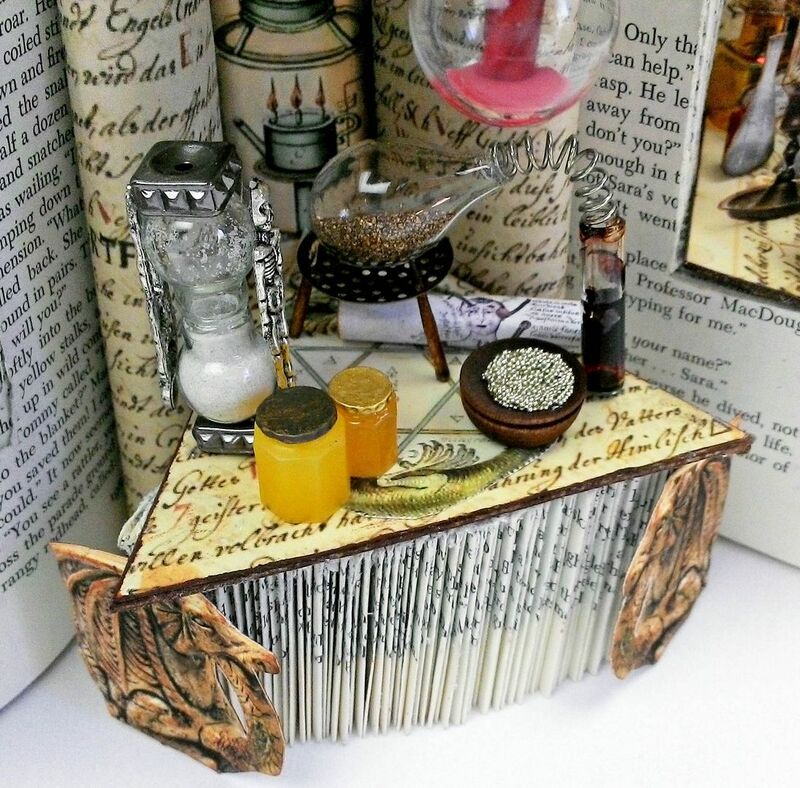 The second altered book is an alchemist workshop. 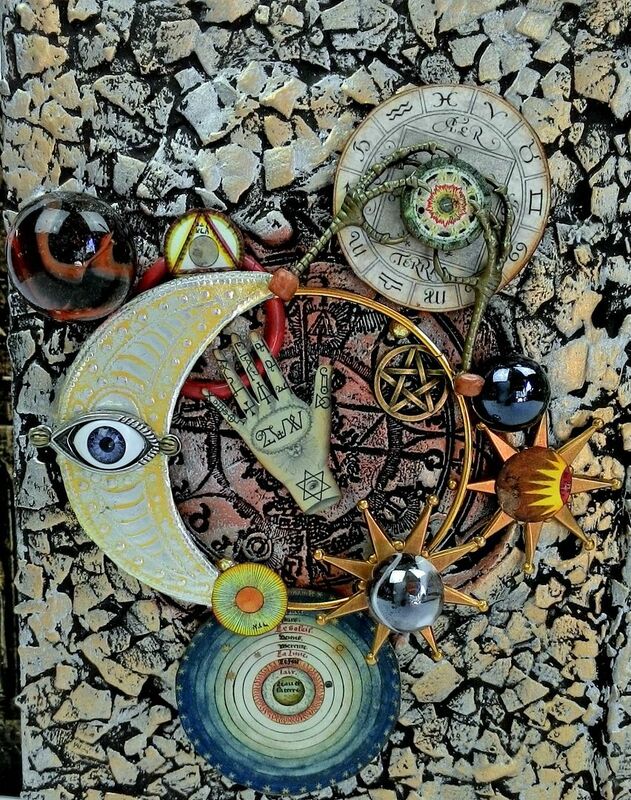 The texture on the cover is created by applying paper clay stamped with an Alchemy themed rubber stamp and egg shells. 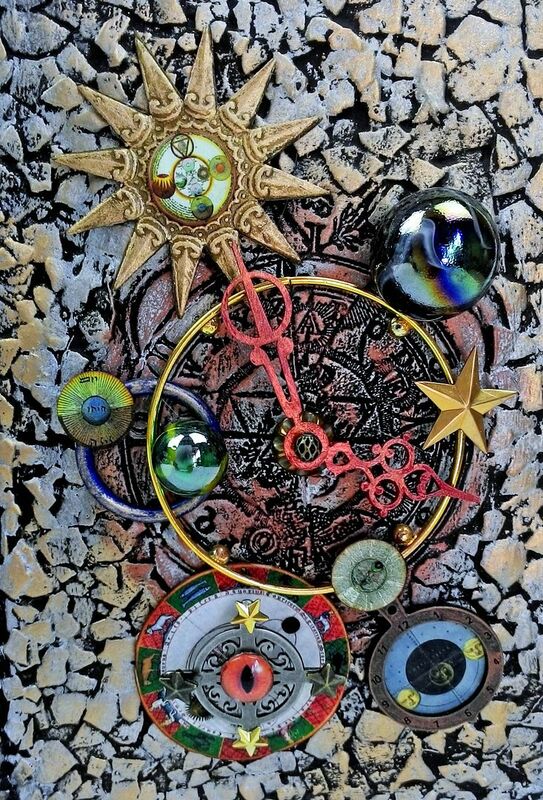 Accenting the cover are collaged celestial embellishments. 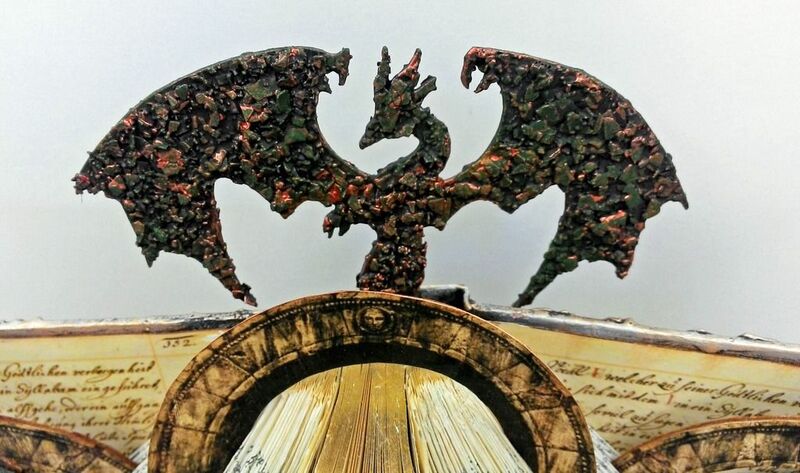 Standing guard above is a chipboard dragon coated with egg shells. 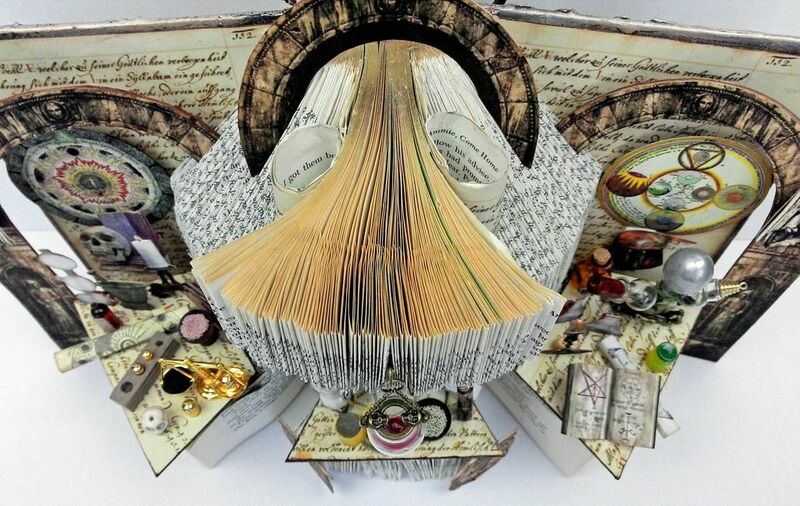 By folding and cutting the pages in the book, you can create architecture. 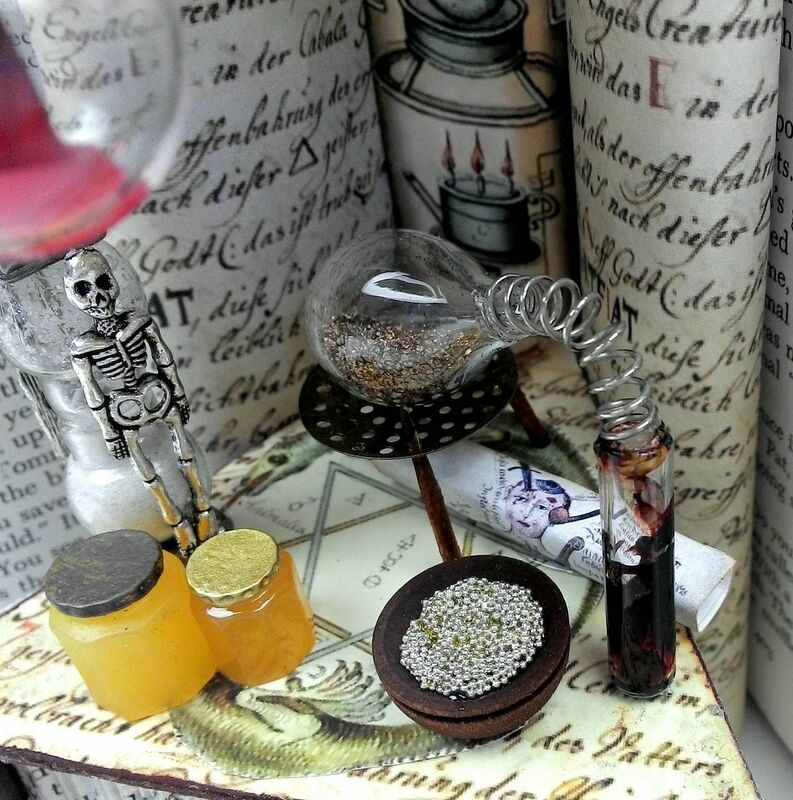 Inside the book is distilling equipment made from bottles, a working hourglass and all kinds of bottles, bowls, candles, a scale and weights and other items that would outfit and alchemist’s workshop. 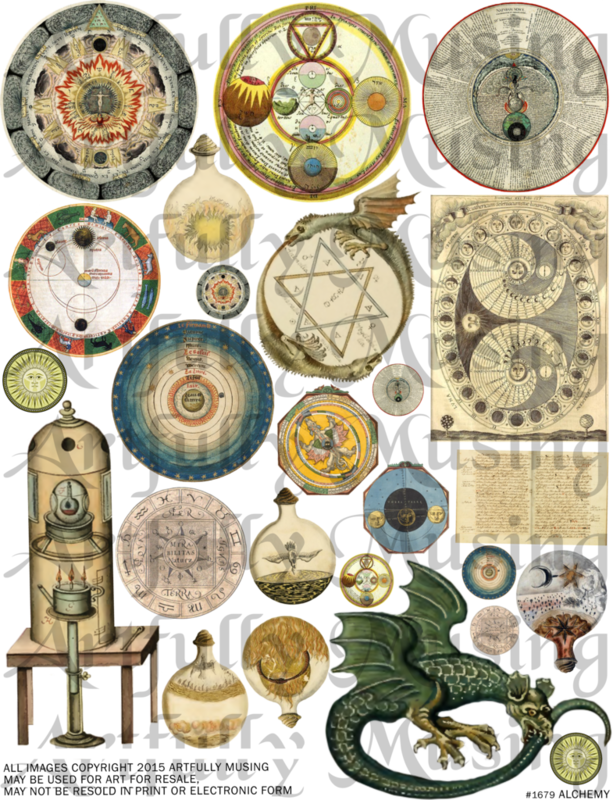 Almost all of the images I’ve used on the books are from two new alchemy themed collage sheets. 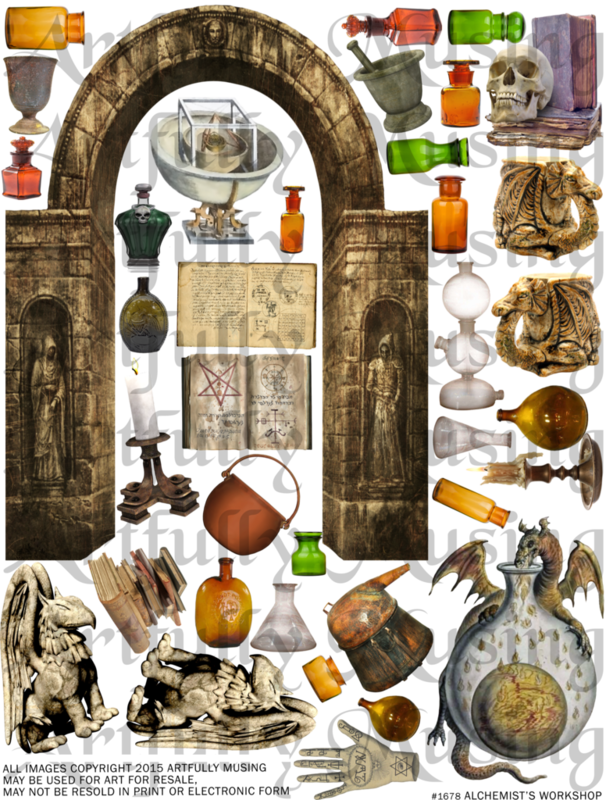 The sheets are loaded with alchemy charts, architectural elements, bottles, distilling equipment, books, dragons and more. 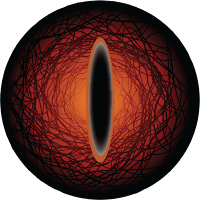 Below is the dragon’s eye I used in the project. Feel free to use it in your art. 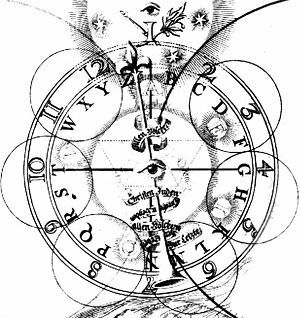 Below is the alchemy manuscript I used in the project. Feel free to use it in your art. Wahoo, very wonderful book which cover made me a little bit afraid! 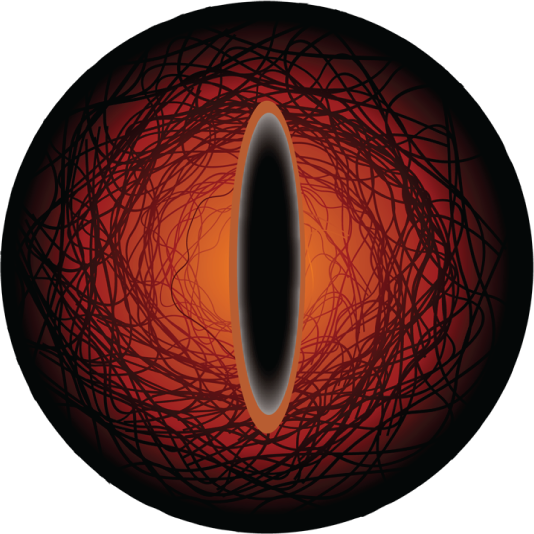 This big eye of dragon, BRRRR! The inside is amazing as all you make! WOW Amazing book. 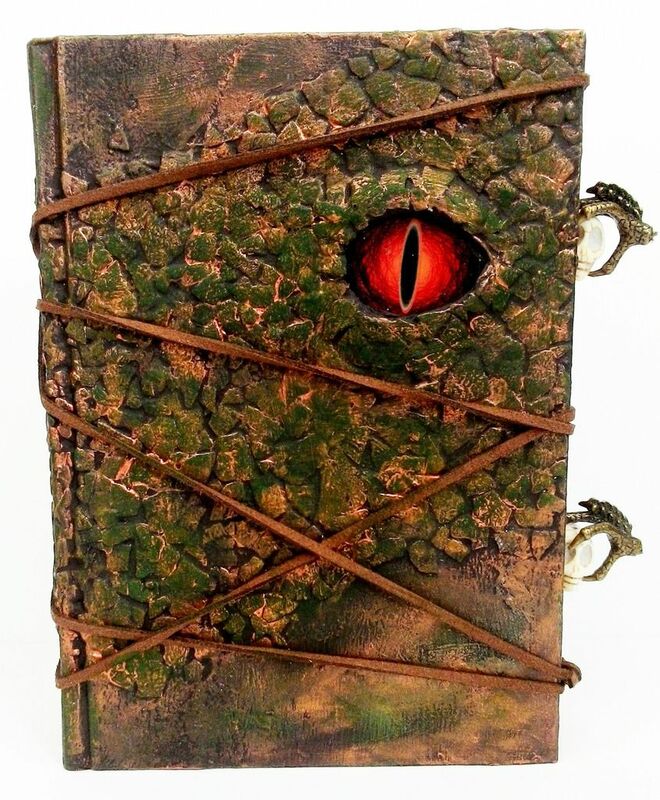 From the big eye in the front to the inside of the book is jaw dropping amazing. WOW I have no more words. Outstanding!! As always, so inspirational and generous with your free graphics. Keep smiling and creating. I too have no problem with Halloween in July LOL. OMG Laura! How do you think this stuff up? You are one clever gal! Beautiful and imaginative in the extreme! WOW, WOW, wow! You are simply amazing my friend. 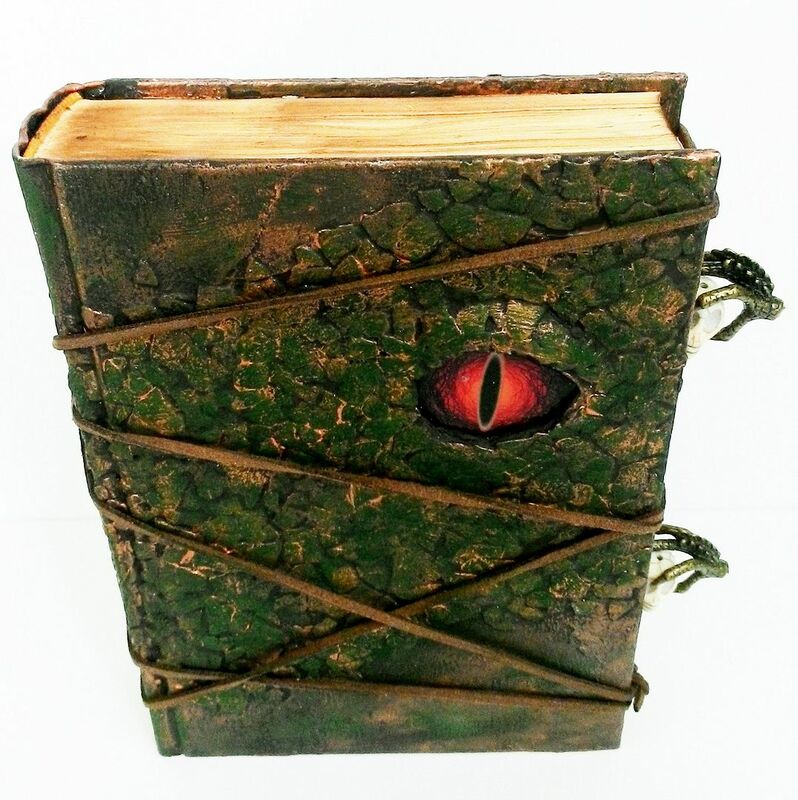 I was able to follow your first book project but then got totally overwhelmed on the second. 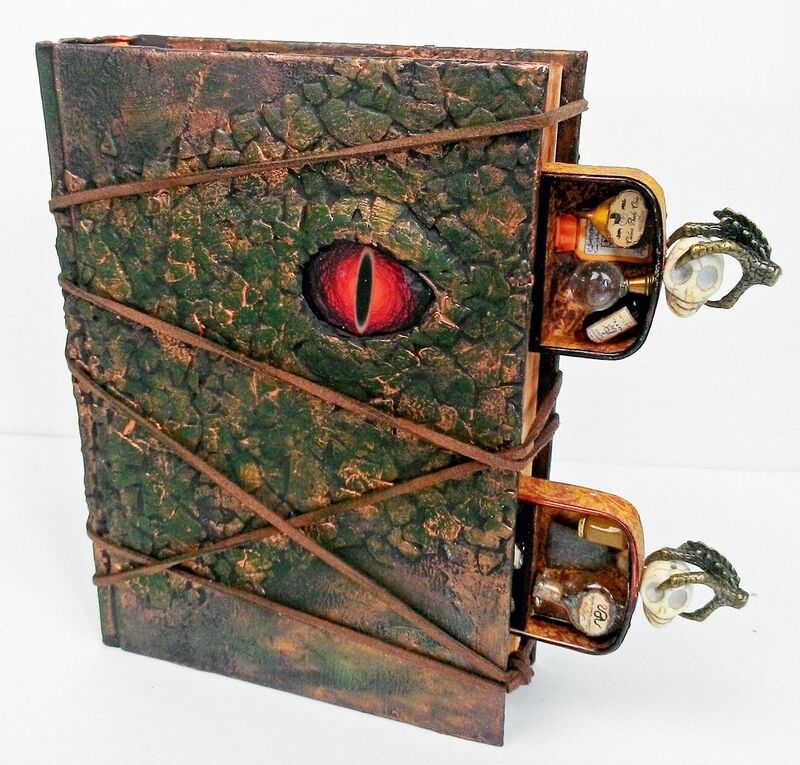 How do you come up with these amazing projects? Just amazing! These are FANTASTIC!!! Thanks for the detailed tutorials. Has Alpha Stamps considered putting together kits where we can purchase everything we need for the project? I think I just swooned! fab u lous!! 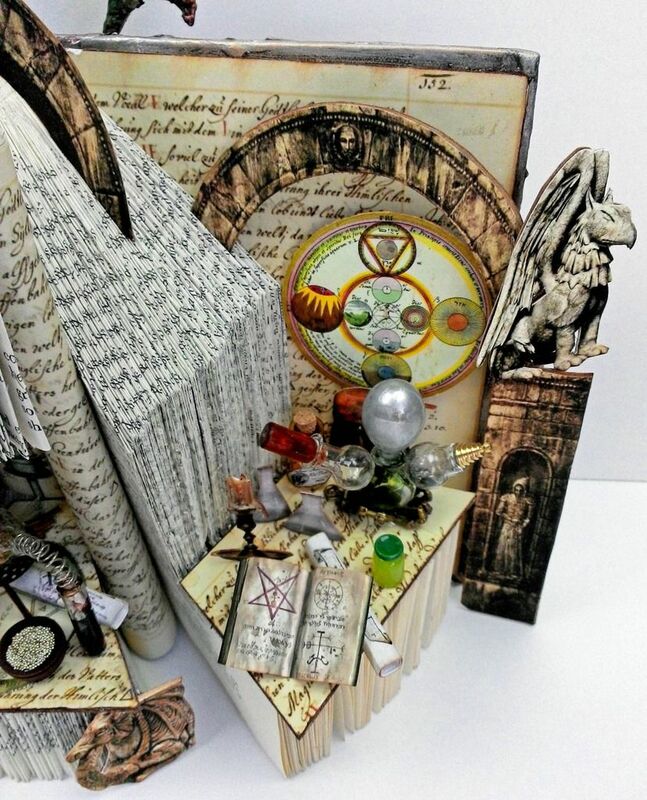 I am not at all into halloween but I have to say these projects are truly amazing in their execution! 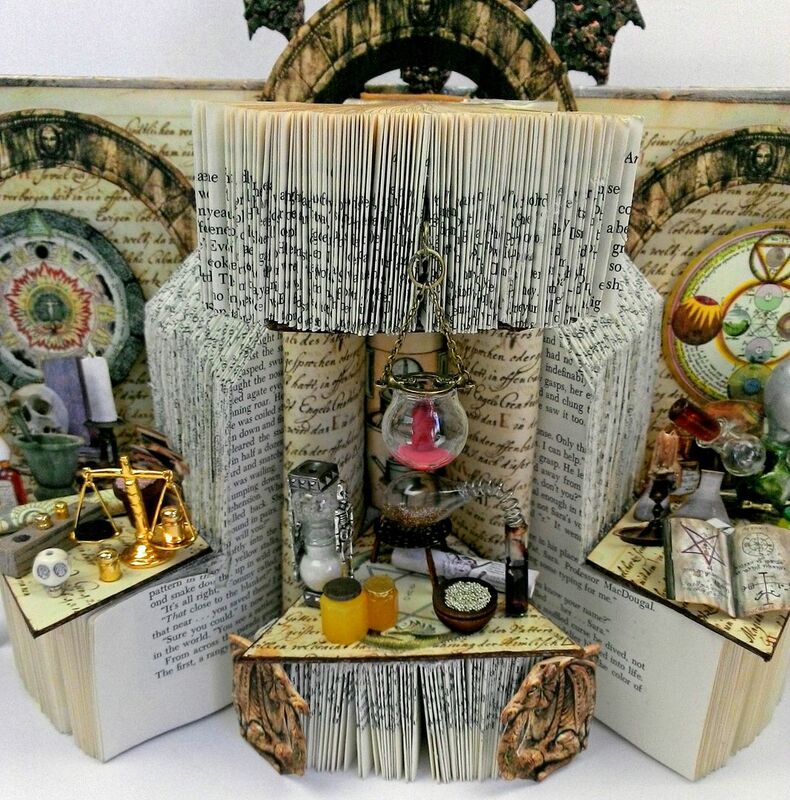 Fantastic work, and I love the texture from the broken egg shells, and the "secret drawers" idea in the first book. 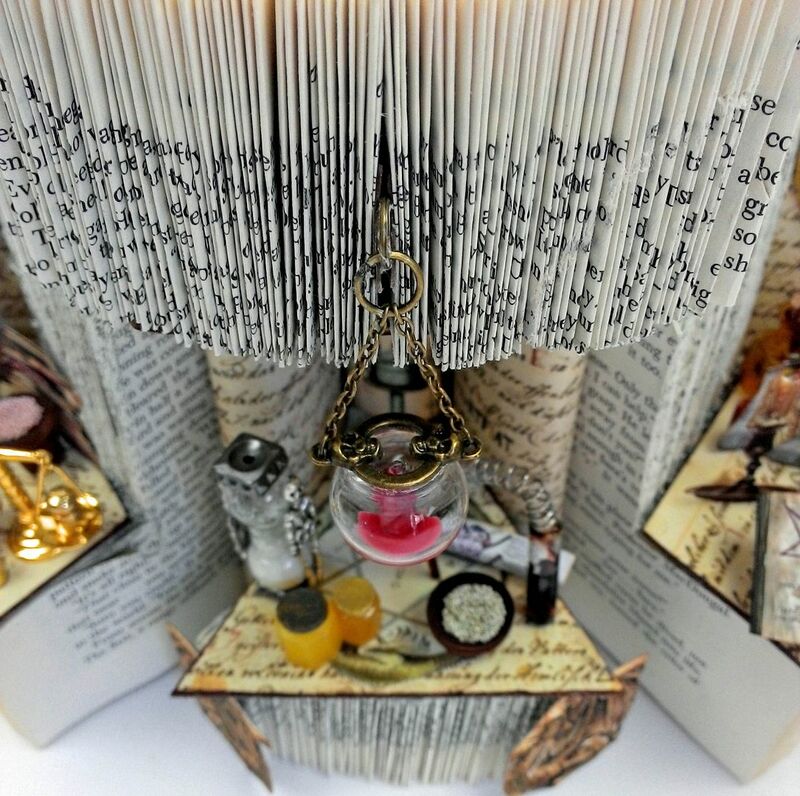 Folding the pages of the second book has made an amazing sculpture and all the embellishments complete the project beautifully. I am full of admiration! I linked back to you and alpha stamps. I'm so inspired to try it, but I'm also sure I can't pull this off like you :) I'm gushing, right? Oh well, I'm not the only one here doing that! You rock! OMG!! 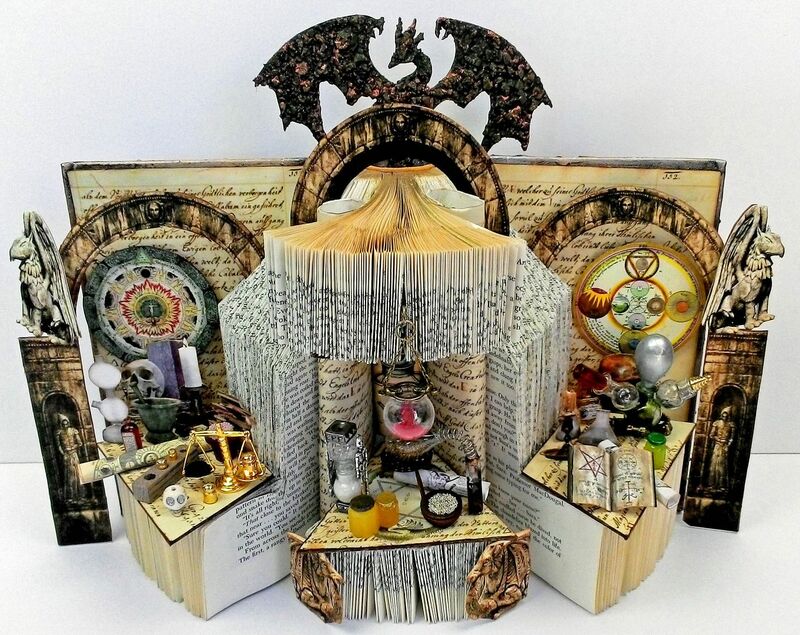 Laura, these are BOTH absolutely incredible, off to watch your videos to find out how you made these amazing altered books! Thank you so much yet again for sharing your amazing talents with us all. 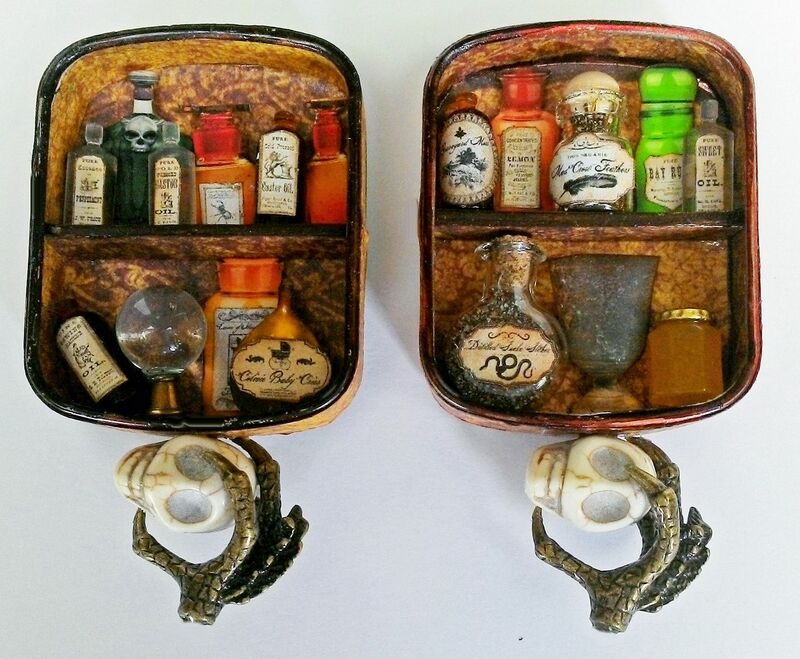 Amazing creations as always - and I love the spookiness! Holy cow Laura. 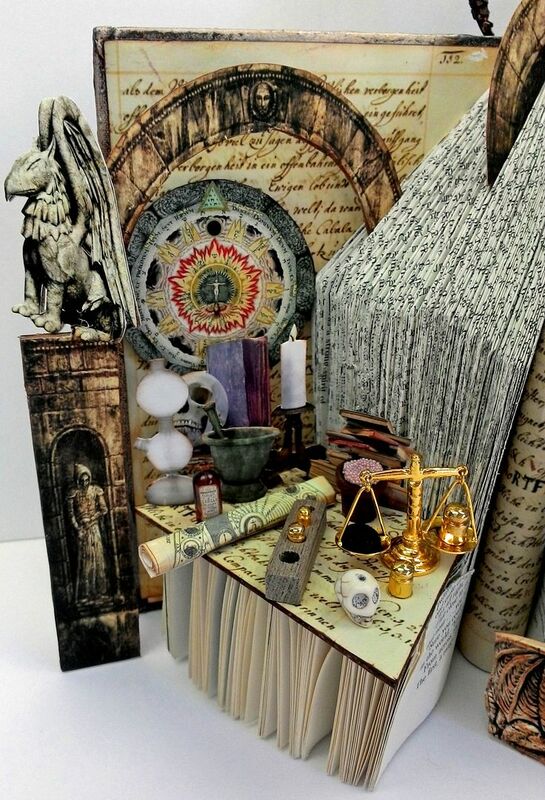 While I always love your work, the alchemest workshop in particular just blew me away. I have to ask...just how long did it take you to make it? It is such labor of love?